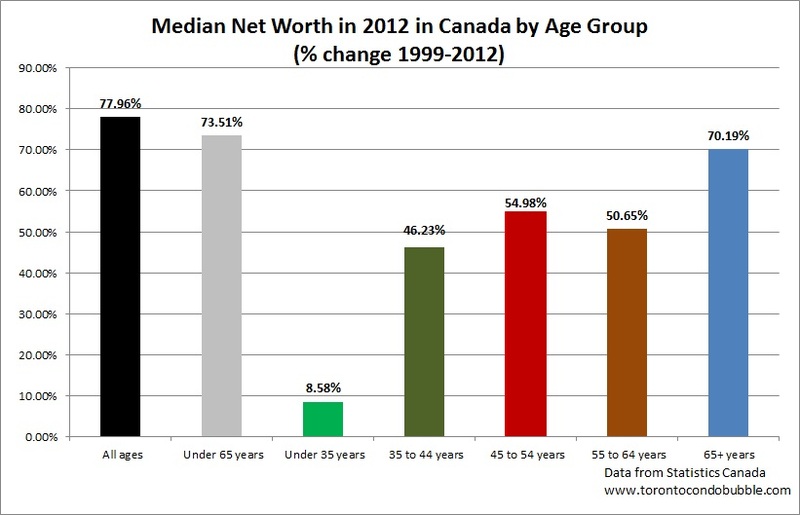 Who cares about the overvalued housing market in Canada when we are getting wealthier with each passing year. After all, rising home prices mean that we are getting richer. A recent study by Statistics Canada showed that the median net worth of a Canadian household increased by 44.5% between 2005 and 2012. Not surprisingly the number one driver of this growth was real estate. 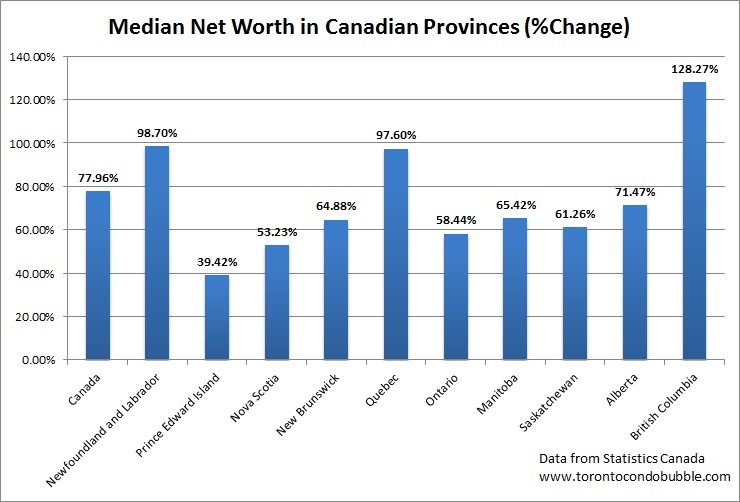 Compared to 1999 ($137,000), the median Canadian net worth was up near 80% in 2012 to $243,000. Just a reminder that net worth equals assets minus debts. 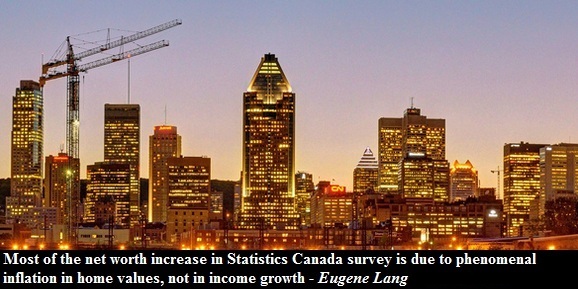 Average net worth in Canada in 2012 was $554,100 according to a 2014 study by Statistics Canada. 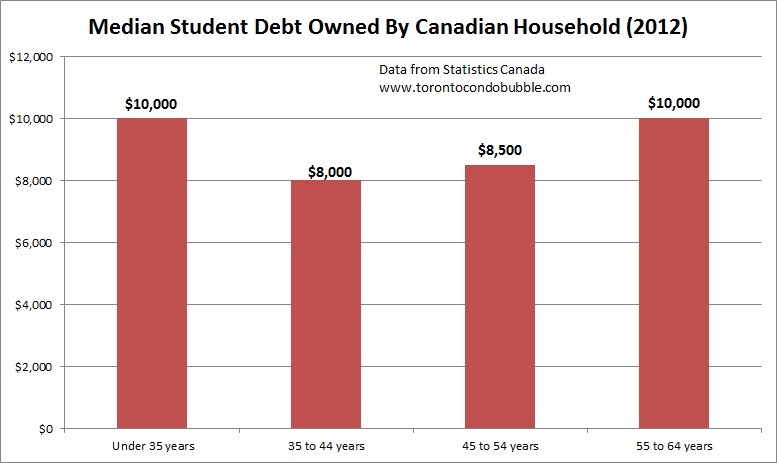 In today's post we will examine net worth, assets and debts of Canadian households. 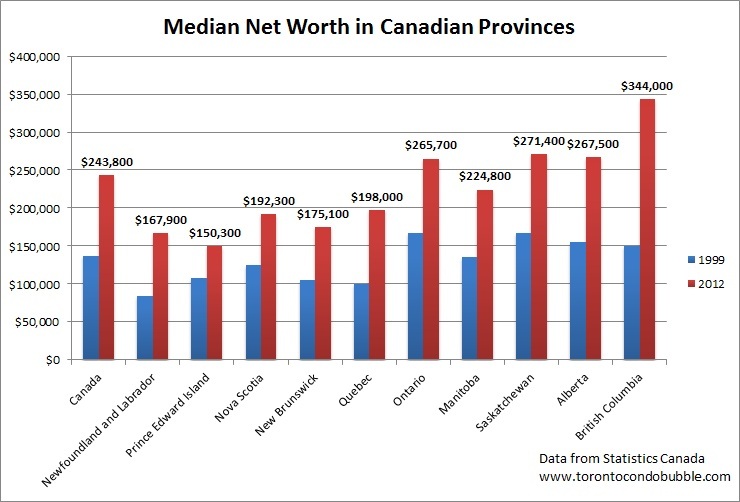 The median net worth was highest in British Columbia, $344,000, and lowest in PEI standing at $150,300. 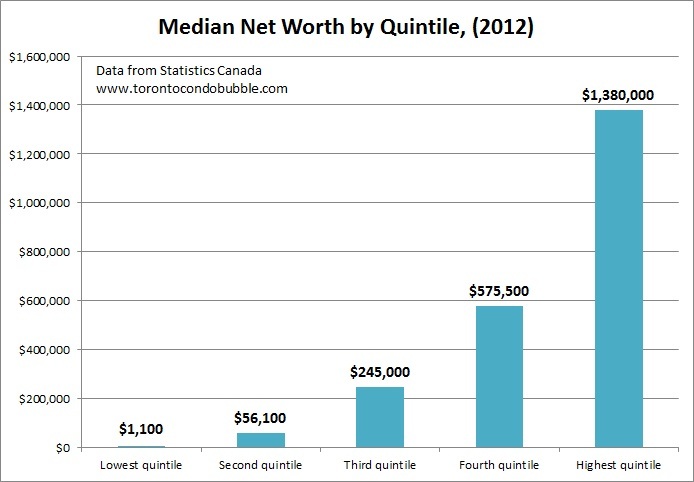 Median net worth in Ontario was $265,700 in 2012. The graph below shows a percent change in median net worth between 1999 and 2012. The highest growth occurred in British Columbia and the lowest in PEI. 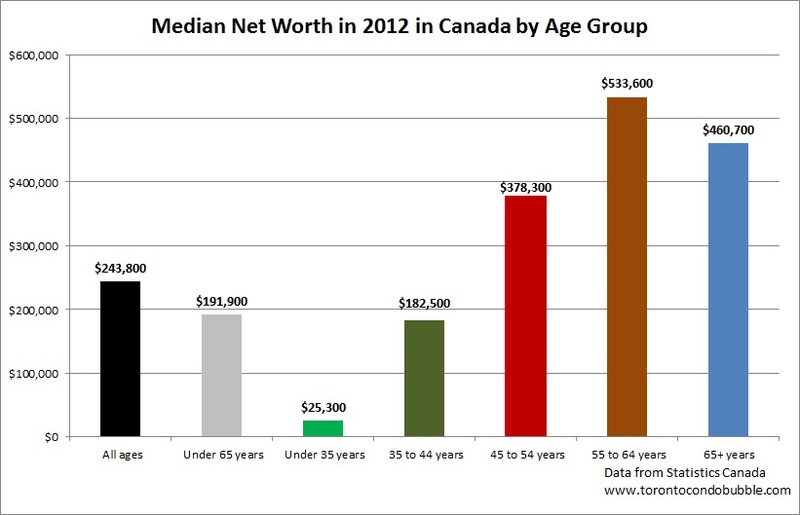 Canadians aged 35 years or less had the lowest net worth. Not surprisingly, the highest net worth of $533,600 was of those aged 55 to 64 years. Here's something interesting. Net worth of those 65 and older increased the most (by 70%) between 1999 and 2012. At the same time, the net worth of those aged 35 and under increased the least, by mere 8.6%. Such poor performance is definitely connected to the fact that the number of people aged 20-to-29 still living with their parents hit 42.3% in the 2011 census, up from 27% in 1981. 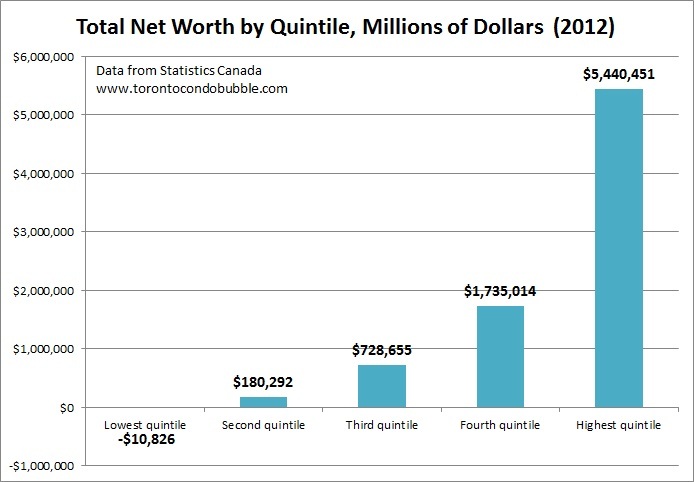 Below is all of the net worth held by Canadian households by quintiles (when population is divided into fifths). 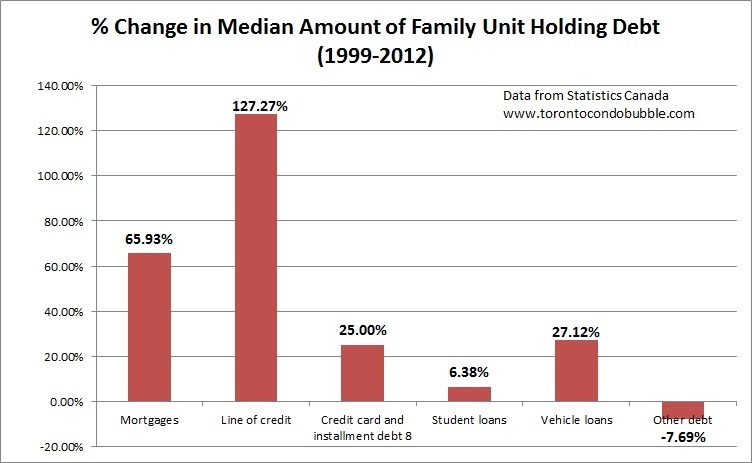 As a whole, the bottom 20% of Canadian households owed almost $11 billion dollars. The top 20% of households collectively had $5.4 trillion in net worth. 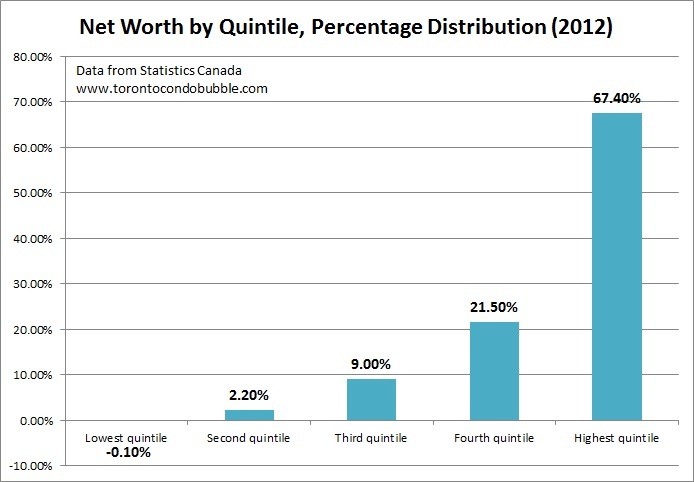 The chart below shows a percentage distribution of net worth held by Canadian households. 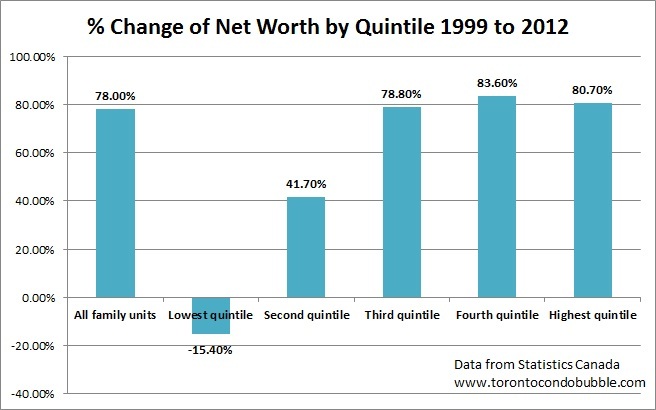 And here's how net worth changed between 1999 and 2012 by quintile. As always - the poor got poorer and the rich got richer. With regards to middle class, at the surface it may appear as if they got richer too, but most of their net worth boost came from real estate. If real estate crashes in Canada, so will their net worth. The bottom 20% of Canadian households have a median net worth of just $1,100. 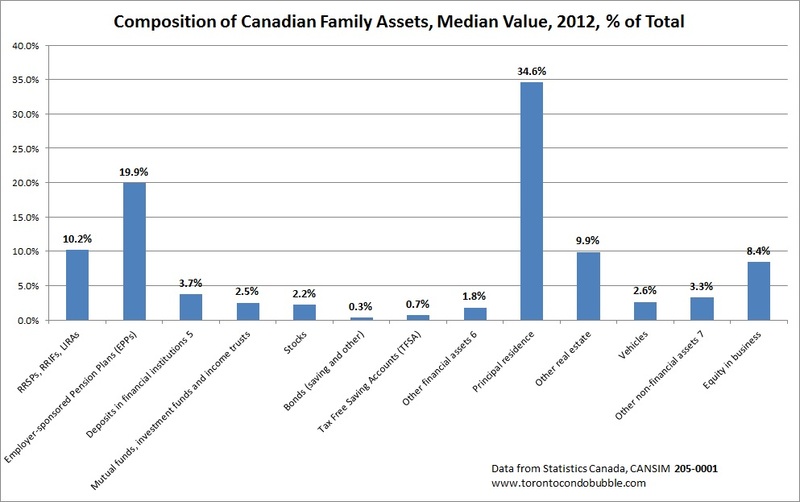 Now let's take a look at the composition of assets in a Canadian household (both families and unattached individuals). 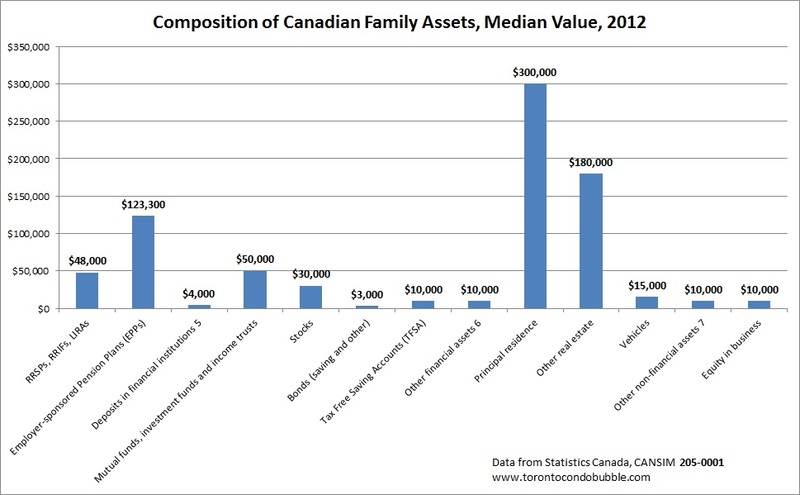 Let me ask you a question: does the composition of assets owned by Canadians seem balanced? That's right, real estate accounts for 44.5% of all assets. Pension assets account for 30.1%. Now let's take a look at total dollar volume. This time I will focus specifically on total assets and real estate totals (principle residence + other real estate). 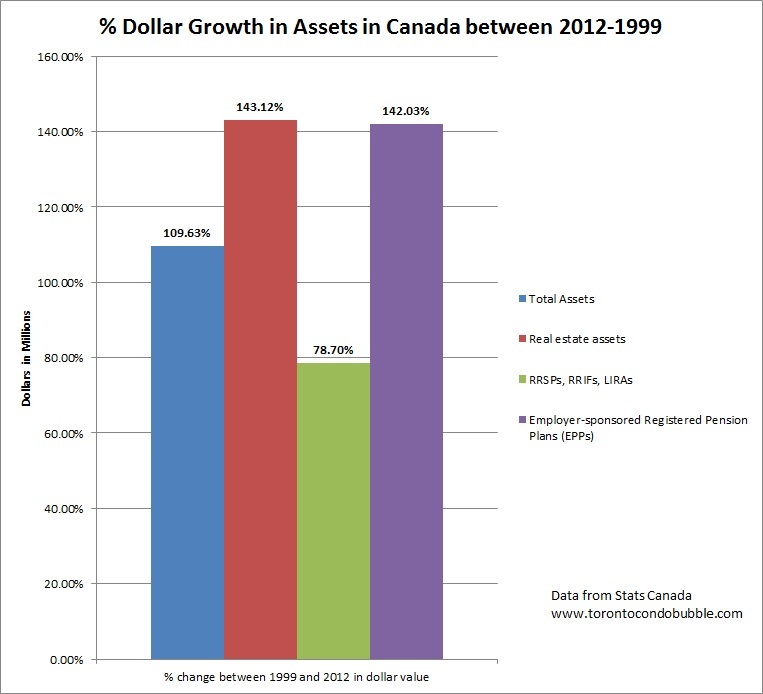 Below is the percentage change growth in total dollar amounts of various assets between 1999 and 2012. I don't really like this chart as it doesn't show the weightings. Total assets by total dollars have increased by nearly 110% between 1999 and 2012. 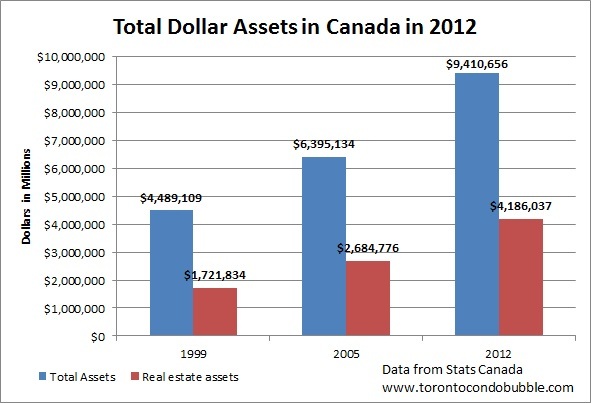 Total dollar amount of all real estate assets (principal residence + other real estate) in Canada increased by 143%. In the chart below I subtracted total dollar amount of total assets in 2012 from 1999. 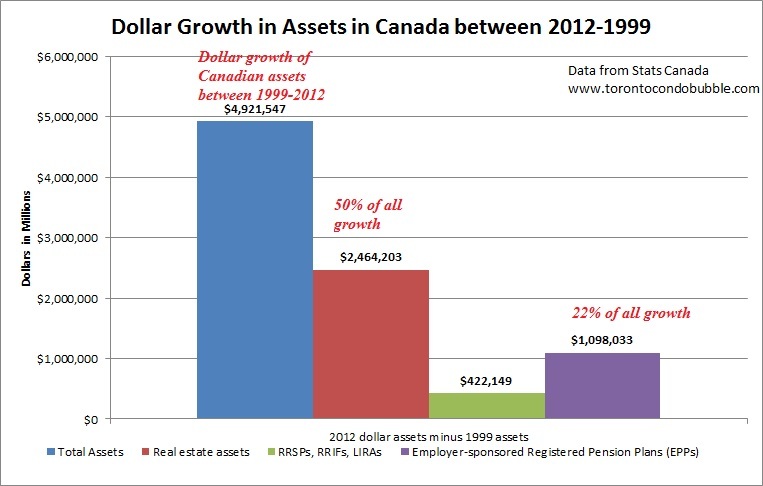 In other words the total dollar amount of all the assets in Canada increased by $4.9 trillion between 1999 and 2012. Real estate accounted for about $2.5 trillion of that growth, or 50%. This should come as no surprise as between 1999 and 2012 home prices in Canada have inflated by 89%. "First, most of this net worth increase is due to phenomenal inflation in home values. The median value of residences was up almost 50 per cent since 2005, which includes the period in which Canada was in recession (when, other things being equal, one would expect house prices to flatten or decline). Anyone who thinks these increases are normal and will continue indefinitely believes in Santa Claus or still holds stock in Bre-X." Now let's say real estate in Canada crashed by 30%. What would that do? The below calculations are rough and based on a scenario where everything else but real estate valuations remained constant. All the values below are in millions and account for inflation. Data source here. If real estate values crashed by 30%, then the overall Canadian net worth would decline by 15.5%. If real estate crashed by 50% then net worth would decline by 26%, or in other words Canada's net worth would almost return to 2005 level. Remember a 50% decline erases 100% of growth. Now let's shift our attention to debts. 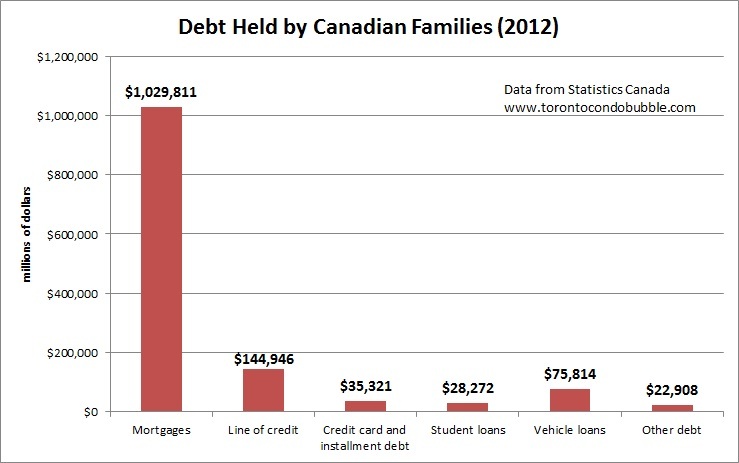 In 2012 total mortgage debt in Canada stood at just over one trillion dollars. That's up 127% from 1999 and 58% from 2005. 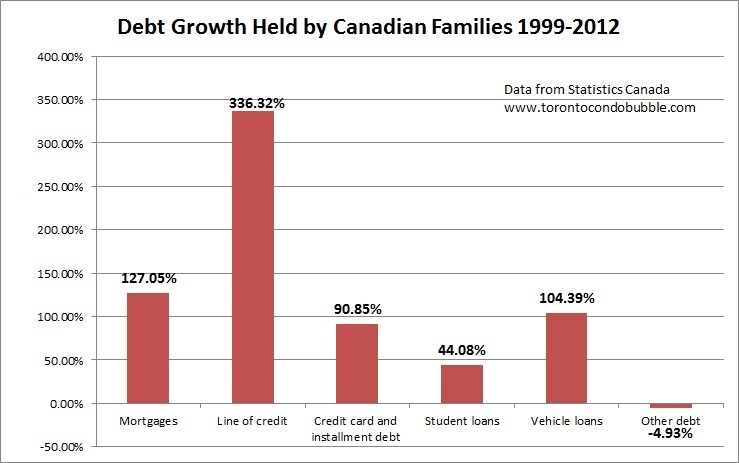 While at the end of the millennium Canadians only owned $33 billion on their credit lines, by 2012 that number increased to $144 billion. A 336% increase. God bless HELOCs. 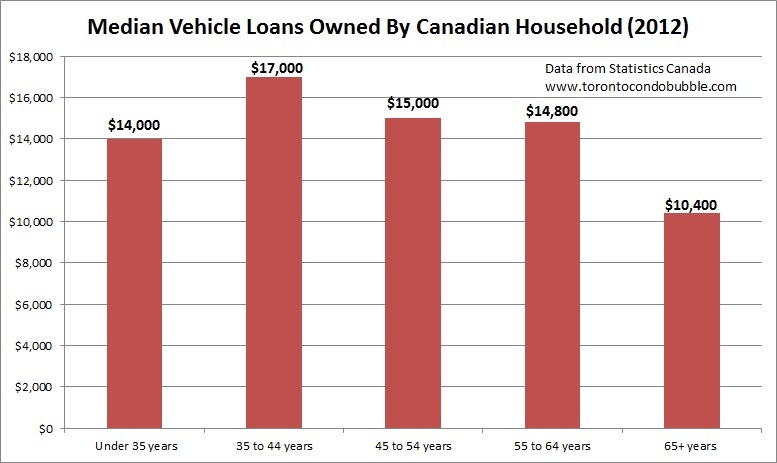 Vehicle debt has also doubled during the same time span. 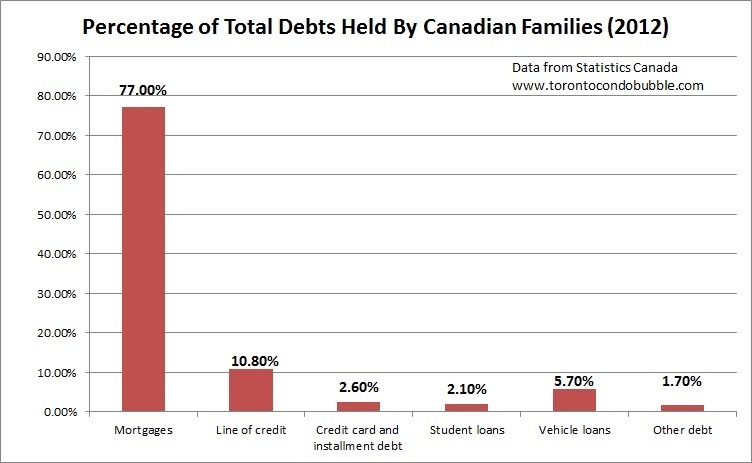 Mortgages made up 77% of all debt held by Canadian families in 2012. Credit line debt accounted for almost 11% while student loans account for about 6% of all Canadian household debt. 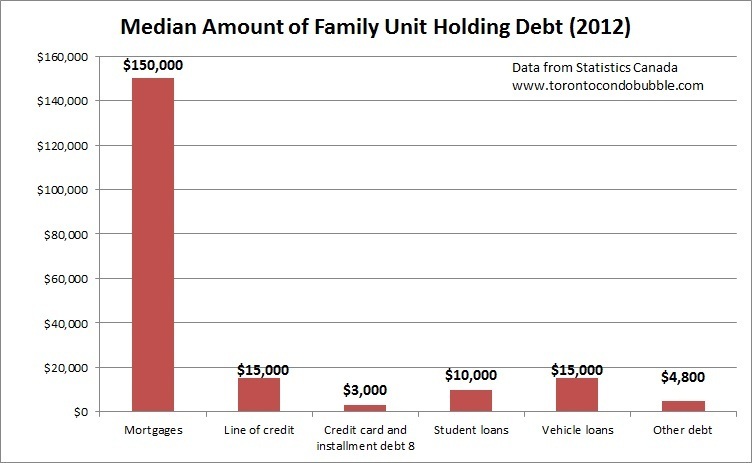 In 2012, the median mortgage debt held by a Canadian family was $150,000. That's up 65% from 1999. Median credit line debt has skyrocketed by 127% as more and more people jumped on bandwagon of renovating their kitchens and bathrooms. So far we've looked at debt composition for all age groups. Now let's dig even further across various demographics. I am not going to lie. 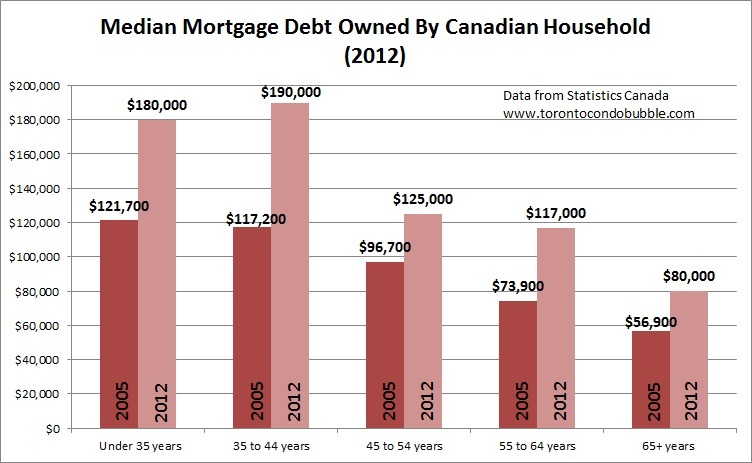 I was somewhat surprised to find out that median mortgage debt of those 65 and older was $80,000 (note that median number was calculated for those who held mortgages). This is a 40% increase from 2005. I suppose younger generations should plan ahead for paying down their parents mortgages unless they are planning on selling those properties. Another interesting fact is that median student debt was the same for those aged 55 to 64 and those under the age of 35. 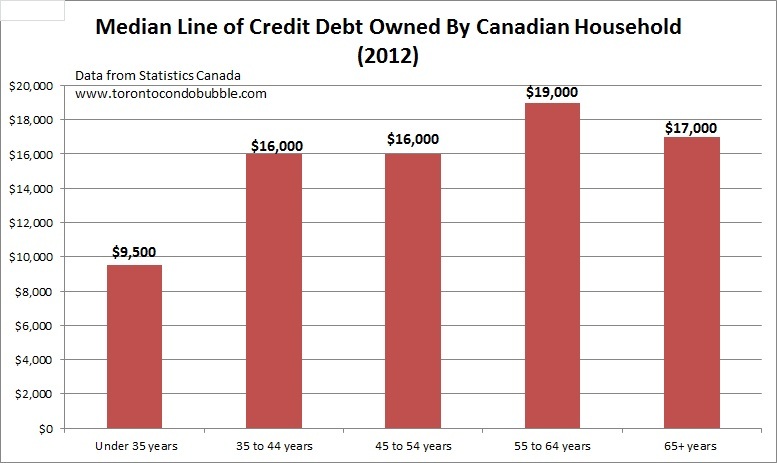 Seriously, how are Canadians aged 65 and up planning to pay off all their debts? Sell their house and rent for the remainder of their lives? Or move into their kid's basement? Oh wait, my kids are already living in my basement so neither plan is an option. Fail! And let's not forgot all the auto loans! In sum, while it may appear that Canadians are getting richer, it is worth remembering that much of that wealth is mostly held in one illiquid asset - real estate. If home prices were to tumble then Canadian households would find that they are not as rich as they originally thought. - all the data in this article was adjusted for inflation. All the numbers are in 2012 dollars.